A cancer diagnosis is one of the biggest challenges many individuals will ever face. Exacerbating that challenge are gaps in prevention, detection, and care coordination that prevent many from accessing the very best care. Earlier this year, the American Cancer Society partnered with the Council for Accountable Physician Practices (CAPP) on a white paper that explored how we can close these gaps and ensure all Americans have an equal opportunity to benefit from the best practices that are proven to work. 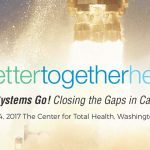 Our report, The State of Cancer Care in America, was presented at Better Together Health — sponsored by CAPP — in Washington, DC, in May. The report examined what we know about coordinated care, including the benefits and challenges of this approach, as well as the current state of care coordination in the United States. Coordinated care offers many benefits across the cancer continuum, including the potential to increase a patient’s access to and ability to complete diagnostic and treatment activities, and promote high-quality, patient-centered care. Despite these clear benefits, the U.S. health system lags behind other developed nations in care coordination measures. In fact, according to the Commonwealth Fund, the United States has the worst levels of coordinated care among 11 wealthy countries. So where do we go from here? If we’re going to create a system that works for patients and ensures no one slips through the cracks, we must embrace the movement toward accountable care-type organizations, patient-centered medical homes, and other value-based payment and care delivery models. This is where we realize the benefits of prevention and care coordination, resulting in lower health care expenditures and better health outcomes. Care coordination should begin with prevention. Systems should help patients access the preventive services that are right for them. If a patient receives an abnormal screening, coordinated care should continue through the diagnostic process to resolution and, when needed, to ensure timely initiation of treatment. Only by working together, the American Cancer Society, CAPP, and stakeholders from all sectors can create a system that works for patients – one that ensures everyone has an equal opportunity to benefit from the strategies that are proven to work. This type of change will ultimately be driven by a shared commitment to institute proven changes to improve care for all. The American Cancer Society’s mission is to save lives, celebrate lives, and lead the fight for a world without cancer. As the nation’s largest private, nonprofit investor in cancer research, we’re finding cures, continuing the fight for access to quality health care and lifesaving screenings, and ensuring people facing cancer have the help they need. To learn more, call (800) 227-2345 or visit cancer.org.